AfriClassical: Eric Conway: The Morgan State University Choir has another extraordinary music-making experience with the Baltimore Symphony Orchestra singing Porgy and Bess! Eric Conway: The Morgan State University Choir has another extraordinary music-making experience with the Baltimore Symphony Orchestra singing Porgy and Bess! The Morgan State University choir had another terrific weekend of music making! We were asked last Spring if we would sing in the BSO's centennial season of George Gershwin’s great American opera, Porgy and Bess! The Morgan Choir has had quite the history with this piece over the years. Back in the days of the now-defunct Baltimore Opera Company, the Morgan choir often was called to be the chorus for their productions of the opera. Also as recently as 2012, the Fine Arts Department produced Porgy and Bess in Murphy’s Gilliam Concert Hall which was considered by many who attended as one of the best productions of Porgy and Bess every seen. I gladly consented knowing that the choir could sing the piece well. Originally, I was told that it would be a concert-version, without costumes, set, or very much of any acting. Well, with the Center Stage Artistic Director Kwame Kwei-Armah (who simply calls himself Kwame) the Meyerhoff was transformed from concert hall to an opera house! The Morgan choir was very excited to participate in this production. 1) We knew that performing with Marin Alsop and the Baltimore Symphony Orchestra is always a very musically rewarding experience. 2) The choir knew many of the principal singers in the production - Laquita Mitchell was the soloist in our world-premier with the Philadelphia Symphony last November and Lester Lynch and Lawrence Hylton (former choir member) were professionals who sang in our Morgan production in 2012. 3) The BSO was going to have an auditions for members of the choir to be hired to sing some of the smaller solo roles on stage - what a great experience! 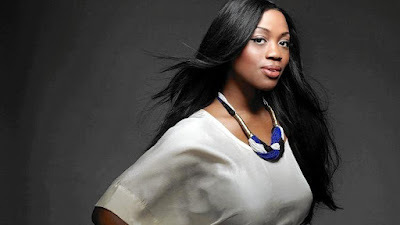 4) Leah Hawkins, a choir member who graduated in 2013 and subsequently finished graduate school at Yale, was hired as one of the principal roles of Serena. Now this may sound like it was a slam-dunk performance for the choir, however, that was not nearly the case. 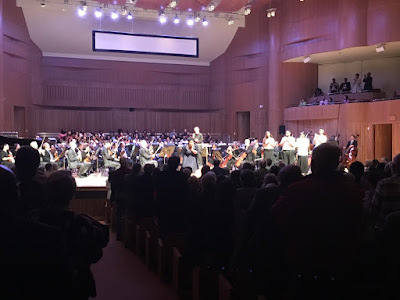 Just during the last week in February, we sang a huge concert that featured Gustav Mahler’s 2nd Symphony which took much time and energy for the performance. During Holy Week in March, the choir went to Los Angeles during our Spring tour for six days away from campus. Given that the Morgan Production was in 2012, most the choir members that were in that production were no longer students at Morgan or in the choir, consequently, I had to teach this piece quickly to a choir that mostly had never sung many of the big choruses from Porgy and Bess. Finally, the BSO was nudging me to try to have the piece memorized for some reason . . .
Well during the first rehearsal it became crystal-clear why the BSO wanted to memorize the score. The vision was to stage the opera as much as one could do on the stage of a concert hall. I was suspect initially, as opera is meant to be sung with the orchestra in the pit, as not to compete with the sound or distract from the drama on the stage. Also, typically there are weeks of rehearsal for musical productions such as this one, however, all the BSO participants only had 5 days to make it work! 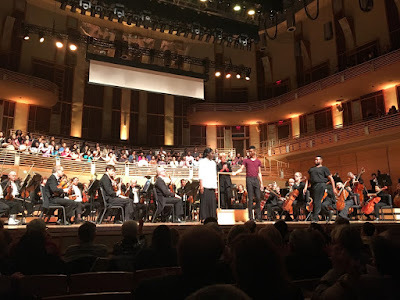 Much to my pleasant surprise, Marin Alsop and Kwame pulled-off quite the feat. The opera was edited down to a length that worked within the constraints of the BSO concert timeframe - from 3 1/2 hours to just over 2 hours. The cuts were made so very well, the essence of the story was still intact with some saying the story held together even better. All of the solo performances were stellar in my opinion. I am always so very proud of Morgan and the musical talent that continues to flow through the university. The choir, in the matter of weeks, managed to learn and memorize the music much to the level that most did not know how quickly it was absorbed. For most the choir, many had never been on the “big stage” before and enjoyed the crash course in being in "show business". The other strength of the Gershwin’s opera is that choir is intrinsically involved in the drama of the story. The choir never felt as though we were just back-up in the production, but thoroughly part of fabric of the show, as much as the principals were. At the end of the day, the choir had yet another extraordinary musical experience, that they will carry with them in their memories for a lifetime. 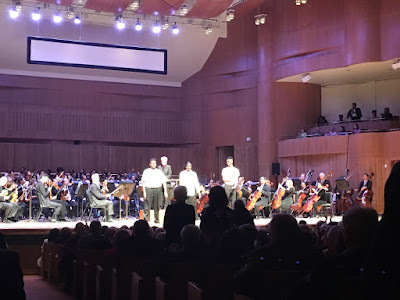 We have sung at the Meyerhoff many times before, but never had the choir received more kudos form patrons and symphony players as from this show. As one looked at the stage, between the principals and choir, if you had any relationship with Morgan, you could not help but be proud - as I was as the choir’s director. See links below to reviews from the Baltimore Sun and Washington Post both giving powerful plaudits to the overall production and specifically to the choir. Also see three one-minute excerpts giving the sense of the energy and drama in the air with a Stacy Harley, a current Morgan student leading "A Woman is a Sometime Thing", a former Morgan choir student in Leah Hawkins singing, "My Man’s Gone" and another former choir member Lawrence Hilton singing "It Aint Necessarily So”.